Before I start talking about the eco pencils I want to emphasise that I call them eco pencils because they are marketed in this or in a similar way. Why are they marketed like this? Because they do not use wood, but alternative materials. While I do believe that they could be more ecologically friendly than wooden pencils I have no proof and in the same way that for example biofuel or hybrid cars bring new problems, there might be hidden problem I do not know of when it comes to the production of the eco pencils. The six eco pencils. Paper left, other materials right. When it comes to wooden pencils there are also big differences, e.g. between pencils using wood from certified1, well-managed forests and pencils with wood from unknown and more dubious sources. It certainly would not be a problem to produce pencils without wood that are actually less environmentally friendly than traditional wooden pencils. In absence of any incriminating evidence I will however give the six eco pencils tested in this article the benefits of the doubt and will refer to them as eco pencils, as intended by their manufacturers. First I will have a closer look at the extruded pencils. Let’s start with the red pencil, made from recycled CD cases. I found this pencil a few weeks ago, somebody must have lost it …or forgotten it …or more likely: did not want to use it any more because it is so horrible (more on this later). When I first found it I was quite excited. The pencil point was broken off, so I could not use it and had to sharpened it in my Deli pencil sharpener 0635, which I soon regretted. You had to use considerably more force compared to sharpening a wooden pencil in the Deli and to be honest, the Deli has not been the same since. The red plastic is much harder than wood and must have somehow blunted the burr cylinder. The Deli 0635 still works, but does not operate as smoothly as in the past. Writing with this pencil is not very nice. The line is not particularly black and the pencil manages to give you a waxy and scratchy feeling the same time. The writing on the pencil reads “Pencil made from recycled CD cases”. I wish it stayed a CD case. On to the next pencil. The Ticonderoga Renew, made from recycled tyres. I was quite excited when I received my pack of ten.This excitement started to disappear when I tried to sharpen these pencils. They are even harder to sharpen than the red CD case pencil. Rotating the pencil in any sharpener will make you fear for the sharpener. I fear the pencil will manage to blunt every blade it touches. Once I started using the pencil any last bit of enthusiasm I had left for this pencil was gone completely. It was scratchy and the line is certainly not dark at all. Sometimes it seems to perform better, so I suspect that the lead is of different quality in different parts …or maybe the difference in performance has to do with the writing angle or the degree of sharpening. Sometimes writing with this pencil is nearly acceptable, but only nearly. Overall it is even worse than the CD case pencil. BTW, there is a warning, printed on the box “Not for use with electric sharpeners”. Last in the category of extruded pencils is the Staedtler Wopex. According to Staedtler the fibre material is made from 70% wood. The pencil is much easier to sharpen then the previous two pencils, but it is still not anywhere near a wooden pencil. 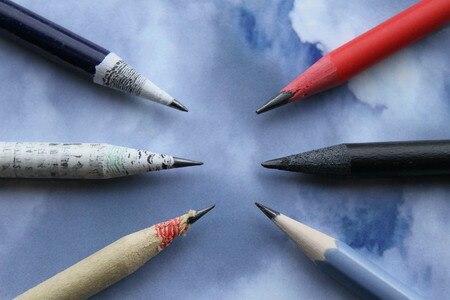 As the lead is extruded, not made the traditional way, writing with it is more similar to writing with the previous two pencils than it is to writing with a pencil that has a traditional lead. Luckily there is no scratchiness, instead the lead is quite waxy. The line of the Wopex is also much darker, more like a line from a traditional pencil. Having used the Wopex for a few weeks now I have to say that depending on the paper and writing surface used, writing with the Wopex can be a very pleasant experience. Its lines are a bit more difficult to erase than those of most traditional pencils and it is about twice as heavy as a traditional pencil, which is quite nice. Another nice feature is its nice, “grippy” surface. Next I will have a look at the pencils that use rolled paper instead of wood. 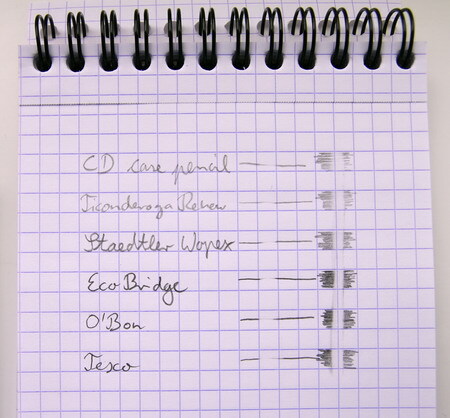 Recently I had a closer look at the Eco Bridge pencils, so I will not go into too much detail again. It is a nice pencil, but one thing I noticed is that, compared to other paper pencils, the rolled paper is more likely to get ripped away during sharpening, presumably because of no, less or different glue applied to the paper before rolling. Next is the O’Bon Newsprint pencil. Mine seems to be made from paper that might have been part of a financial newspaper from mainland China. The pencil is made in China, but the newspaper you can see on the packaging of the pencils seems to be from Malaysia, which is where O’Bon seems to have its origins (don’t quote me on this, I am only 99% sure). Malaysia seems to be the new El Dorado for stationery lovers. If you like pens from the higher end of the market you might have come across Pen Gallery, an online shop from Malaysia. Pelikan is kind of Malaysian too. Pelikan, and recently Herlitz, were bought by a Malaysian business man and stationery aficionado who, according to some newspaper articles I read, fulfilled his lifelong dream when he bought this stationery giant. 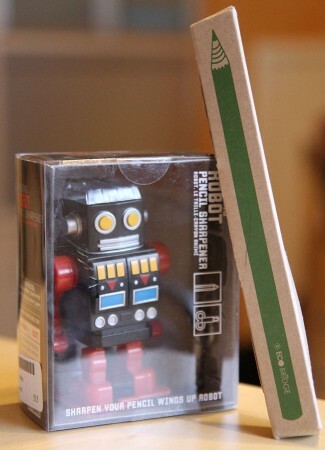 A lot of Faber-Castell products are made in Malaysia, too …so now it turns out O’Bon is from Malaysia as well. I wonder whether this is more than a coincidence. On the other hand Staedtler closed its factory in Malaysia this year. OK, one last Malaysia pencil fact: The most common pencil grade in Malaysia is 2B. Getting other grades is even quite difficult. Back to the O’Bon pencils: they are actually very good. Even though they are 2B they hardly smudge and the line is nice and dark. Unlike the Eco Bridge pencils the O’Bon pencils can be sharpened and still look good, as the paper does not rip away. Now to the last paper pencil. 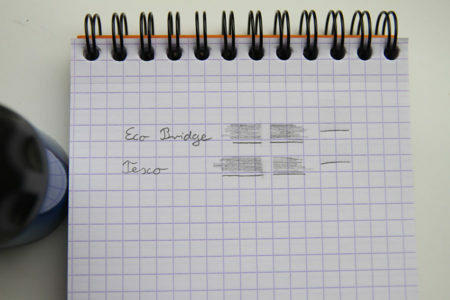 The Tesco paper pencil is quite similar to the O’Bon as it is also made from real newspaper, while the Eco Bridge seems to use paper specially made for the pencils, which reduces the eco-ness considerably. The Tesco pencil is also slightly slimmer than the other two paper pencils and much cheaper. The surface is smooth like the O’Bon’s surface while the Eco Bridge pencil has a rough paper surface. By far the biggest drawback of the Tesco pencil is that it smells horribly for several days after taking it out of the package. Something that makes me think that the glues being used cannot be too healthy. On the plus side the Tesco pencil is one of the cheapest pencils around, but my local Tesco stopped stocking them so I fear they might be difficult to come by in the future. Unfortunately most of the pencils are only available in some markets. The Ticonderoga Renew box has a UK address printed on the reverse, but I have never seen this pencil in the UK. Staedtler has a worlwide distribution network, but the Wopex does not seem to be available in all markets. The Staedtler Wopex is, without a shadow of a doubt, the winner of the extruded pencils tested here. There are of course also other extruded pencils, like the ones from BIC, but they were not included as I have never used them. Last time I used other extruded pencils they were horrible writers, similar to the CD case pencil and the Ticonderoga Renew, so I assume that there are not many nice extruded pencils available. One problem with the Wopex that I should point out is that the last millimetre of the point can break easily if you have over-sharpened it. The winner of the rolled paper pencils is the O’Bon Newsprint. It can be sharpened without problems, the surface finish is really nice and it does not have the horrible smell the Tesco pencil has in th ebeginning. One interesting point I should mention is that some of the eco pencils (Wopex & O’Bon) claim that they last longer than normal pencils. I have not looked into this yet and cannot comment on it. If you think you noticed that they last longer please let me know. I would like to thank Sean from Pencils and Music for the Ticonderoga Renew pencils. I found a Ticonderoga Renew review at Quality & Style. I would like to thank Lexikaliker for my first Wopex pencil. You will find reviews of the HB and 2B Wopex on his blog (Google translation). You can find a review of the Wopex (in English) at pencil talk. I would like to thank Kevin from O’Bon for sending me the Newsprint pencils free of charge. Even though I received them free of charge I tried to be objective and believe that this article was not influence by the fact that I received the O’Bon pencils without having to pay for them. You can find a review of O’Bon pencils at pencil talk.